Please note that the ragwort event on Saturday 18th August has been cancelled. Are you free on the morning of Saturday 18th August and able to do a bit of hard work to help local wildlife? We’re organising a work party to assist a local farmer to clear ragwort from the flood meadow on the east side of the river. This will help him maintain cattle grazing there without the need for chemical weed control, and so benefit wading birds. This will be the 3rd year in a row LCPRE have helped clear the ragwort! If you can get involved, please email lcpre@elywildspace.org.uk. We’ll meet on the A142 bridge over the river (just south of the station) at 10.30am. Wear long sleeves and trousers, and bring gloves, as ragwort is poisonous. Thanks to a Supreme Court judgement we have a second chance to protect Ely Common and gain Village Green status. 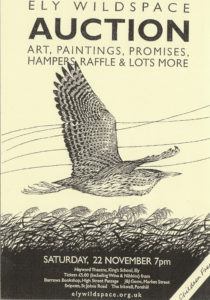 To raise money, we are planning an Auction of Art and Promises. David Palmer of TV fame has once agreed to be the auctioneer, so it will be a very entertaining and fun evening! We are busily collecting pieces of work from generous local artists and have some interesting promises that could be used as really special Christmas presents. There are hampers, gifts and generous raffle presents. Please let us know if you would like to donate something to the auction. Further details will be available on the website in due course. Please do come along, spread the word, and bring your friends and family. The auction will take place at 7.00 pm on 22 September in Needham’s Hall, City of Ely Community College. Tickets are available from Burrows Bookshop or on the door, costing £5 or six for £25 and include a glass of wine and nibbles. There is ample free parking. We look forward to seeing you at what promises to be a really entertaining evening. Thanks to a Supreme Court judgement we have a second chance to protect Ely Common and gain Village Green status. To raise money, we are planning an Auction of Art and Promises. David Palmer of TV fame has once again agreed to be the auctioneer, so it will be a very entertaining and fun evening! We have collected numerous pieces of work from generous local artists (for photos click here) and have some fantastic promises that could be used as really special Christmas presents. There are hampers, gifts and generous raffle presents. Please let us know if you would like to donate something to the auction. Do join us on Saturday 4 August to find out all about the plants of Ely Common. We’ll learn how to identify what plants are there and add to the baseline data collected through last years plant survey. Meet in the Environment Agency car park off Prickwillow Road at 9 am. Bring water and sunblock/rain gear (as appropriate).